Como Audio Musica review | What Hi-Fi? The Como Audio Musica does a lot, but unfortunately not to a standard worthy of its considerable price tag. Premium all-in-one CD-player/streamer/radios are like buses: you wait ages for one to come along, and when it does it’s not even the one you want. The Como Audio Musica is the second one-box CD/streaming solution we’ve heard in the space of a couple of weeks (there was also the Roberts Stream 67), and while we’re all for them as a concept, there remains plenty of room for another to come and sweep us off our feet. Como Audio’s features list is certainly on point. The Musica has a single CD slot-loading mechanism ‘built to rigorous automobile industry standards’, and plays CD, CD-R and CD-RW discs. On top of that is a USB for those with digital files – compatible with AAC+, MP3, WMA, WAV FLAC and ALAC formats –and also a 3.5mm analogue input. 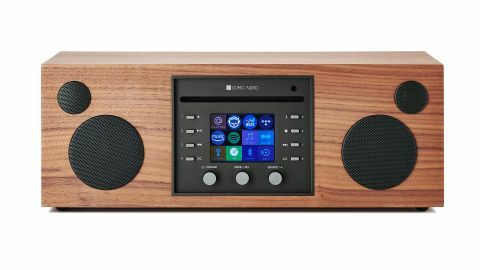 It also plays non-physical media via wi-fi, aptX Bluetooth, built-in streaming apps such as Spotify Connect and Tidal, and FM, DAB and internet radio. Plug in an Alexa-ready Amazon product and you can also control the Musica, and access your Amazon Prime Music collection, with your voice. Inside is 30W per channel of Class D digital amplification, driving a pair of 19mm soft dome tweeters and two 8cm long-throw, four-layer voice coil woofers, whose response can be tailored via the Musica’s customisable EQ. Unfortunately, the exterior is a little at odds with what is a generally impressive spec sheet. The MDF cabinet – available at this price in Walnut wood finish, or Hickory, White or Black for a £50 premium – feels somewhat boxy and outmoded, while its rubber preset and control buttons and trio of small aluminium dials don’t suggest a unit costing much more than a few hundred quid. There is a full colour screen that displays album artwork, channel information and the like, but it does little for us to bring the Musica’s design to anywhere near its main competitor, the aforementioned Roberts Stream 67. The best we could say is that the design is inoffensive, which unfortunately translates to its musical performance as well. The balance is decent, with a rich midrange a particular highlight. The Musica makes good use of its dimensions to dig relatively deeply into bass frequencies, with a confidence that proves Como Audio’s tuning of these low frequencies is no accident. It provides a platform for full-bodied mids, and also means the Musica is particularly at home with vocal-led tracks, offering singers a good deal of warmth alongside a favourable level of detail to give sonic insight into tone and timbre. Ironically, given the moniker Como Audio has decided to use for its all-in-one, the performance isn’t all that musical. We couldn’t describe it as rhythmically inept, but timing is a bit of a struggle. We could perhaps forgive difficulties with expertly organising particularly challenging pieces in a one-box unit like this, but the Musica never feels entirely in control with a simple 4/4, let alone anything more intricate. Again, it isn’t bad enough to make it unlistenable, but it’s still a way off the kind of composure we’d expect for this sum of money. A relatively flat dynamic expression doesn’t help, either. There are traditional hi-fi products much further up the chain that can appear incredibly bored by what they’re playing, and the Musica manages to avoid anything so damning as this, but there remains little emphasis on leading notes, while large-scale shifts are suggested more than dealt with heavy blows. Compared with the Roberts Stream 67, you realise neither unit is perhaps entirely expert in these regards – certainly not for them to receive full marks – but the Musica is quite clearly a length behind. That said, Como Audio has kitted it out with plenty of features, and we’re sure many will be kinder to the way the Musica looks and feels than we are, so it could appeal for a little background listening. Just don’t expect anything special.